This blog has been quiet over the past few days because your humble correspondent has been in sunny Reykjavík, Iceland for some two and a half days. 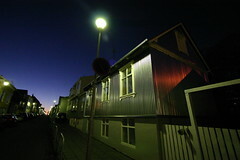 I found Reykjavík to be a very pleasant and interesting place, which manages at once to be small and cosmopolitan. But more impressions later. Over this weekend, I managed to take a lot of photos (which are making their way here), to see a few gigs (including a Jens Lekman solo set and the first Ninetynine gig I've seen since leaving Australia), pay through the nose for a glass of Viking lager, drink a coffee in Kaffibarinn whilst Architecture In Helsinki played on the PA, and visit the Blue Lagoon (which is highly recommended). And I managed to find a DVD of a brilliant Icelandic film I saw at the Melbourne Film Festival some years ago, "Englar Alheimsins"; there seems to be nowhere outside of Iceland that is aware of this DVD existing, whereas when you walk into Skífan (which is apparently Icelandic for "HMV"), you find a raft of copies in the Icelandic film section, all with optional English subtitles. Go figure. I really enjoyed visiting Reykjavík, and intend to go back. Next time I'll probably stay for longer than a weekend, and travel around a bit more. And probably will catch a later flight out than the 7:15am one. There are no comments yet on "A weekend in Reykjavík"